Heat transfer foil is made by rotograuver process. Image is created by color pigment. Multi color jobs can easily be created. The foil consists of adhesive lacquer, ink layer, protective lacquer and release paper. Metalic foils are also present in silver and golden. We offer foil cutting machine which can slice precisely upto minimum 7mm width. - We offer up to 9 colors printed Heat Transfer Foils. These most modern and refined label provides clean, crisp and environmentally safe mode of out layer which is important in the present day health and safety work environments. Add brilliance and remarkable shine to any one-color design with our Foil heat transfers. 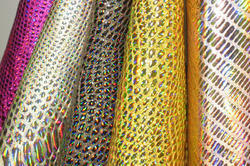 Foil enhances the look and feel of garments by adding radiant color and luminosity to any graphic. Apply it by itself for a lustrous design that really “pops, or on top of a water-based screen-print to create a multimedia effect that will help your garment stand out in a sea of ordinary. Inter Films India Pvt. Ltd.
We bring forth for our clients, a quality assortment of Heat Transfer Foils, specially made to use on plastic. Our offered foils are available in a wide variety of finishes and can be used to decorate thermoplastics, thermostats, wood, book cloth, leather and textiles. Owing to easy set up, durability and strong adhesion, these are high in demand in the market. We have gained vast expertise in offering our customers with an assortment of Metallic Heat Transfer Vinyl Foil. We provide our customers an extensive range of Heat Transfer Foils. These products are available in diverse patterns that meet on customer’s demand. 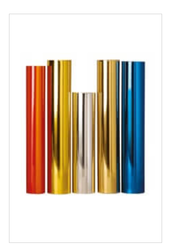 We supply the best quality transfer foil for full and partly transfer on PU, PU Leather and Raxin Transfer, Silver, Gold and many more colors available in 12 and 16 mic. foil in with of 50" to 60" and 3000M length. We are recognized as one of the trusted Manufacturers, Exporters and Suppliers of a high quality range of Heat Transfer Foil. We are one of the leading supplier of foil heat transfers in our locality. We are involved in providing a wide range of Hot Stamping Foil to the clients. These foils are manufactured using optimum quality raw material, which is procured from trustworthy vendors. We also offer customization of these products as per the requirements of our honorable clients. Crystal Foil for design printing on Leather and rexine.